Carrick Castle Boat Club was founded on 10th February 1989. There are currently 35 members in the club as at 1st January 2018. The 2018 Membership Fee to the Carrick Castle Boat Club is £15.00 per annum per household plus a one off joining fee of £15.00 to cover new member administration costs. Annual membership and mooring fees must be paid by 3rd December in the year preceeding new membership as Crown Estate Scotland’s accounting period for moorings is 1st January to 31st December as is the club’s. New club moorings will be invoiced at £40.00 per mooring. Invoices are sent out to members on 3rd November annually for the following year. Only one reminder will be sent out in future on 21st November if the payment has not been made by that date to ensure payments are made on time by 3rd December. Crown Estate Scotland mooring tags have been issued to mooring owners from 2016 and will last for 5 years. Members have to pay their mooring fees annually even though Crown Estate Scotland tags are issued once normally for a period of five years from 1st January 2016, etc.. If a member no longer wishes to have a mooring, Crown Estate Scotland mooring tag must be returned to the club for the club to return to Crown Estate Scotland and the mooring must be removed from the seabed by 31st December prior to commencement of a new financial year. The club will always try and find a buyer for a member who wishes to sell their mooring advertising it on the For Sale & Wanted page. Members will be entitled to the reduced mooring fees that the club obtains from Crown Estate Scotland and may join any of the schemes or events of the club. To become a member of the Carrick Castle Boat Club you do not have to own a mooring, however if you want a mooring you must own a boat. Only one member of a family membership is entitled to vote. The club arranges a number of social events throughout the year; there will be more Boat Musters annually in mid-August where all members and friends have had great fun every year since 2004. Check the gallery for pictures of those events. The next Muster will be held at 12 noon on Sunday 12th August 2018 at Swine’s Hole, Carrick Castle. Members will also be able to obtain discounts from various suppliers on production of a valid annual membership card. Members will be advised of the suppliers who offer such discounts – See Members Discount Scheme. If any members have any boats, moorings or nautical items for sale or are looking for something, members can advertise for free on the For Sale or Wanted page. If you wish to become a member of the Carrick Castle Boat Club please download the Membership Application Form – Download Club’s Membership Application Form and complete it, sending it with a cheque for £30.00 (£15.00 annual 2016 subscription and £15.00 joining fee) to the address on the form. Please read the Carrick Castle Boat Club’s Constitution before signing this form as you must abide by this as a member. If you wish to apply for a mooring position too, please ask the Secretary to contact the Moorings Officer (Jim Graham) for a suitable mooring position for the size and weight of your boat. Once you have been allocated a mooring position you should send a cheque for the appropiate amount to the club so that a Crown Estate mooring tag can be applied for. Crown Estate Scotland Mooring Fee to club members is currently £40.00 per annum. The club can also provide you with a Private Mooring tag free of charge (recommended) – see photo. The slipway gate and slipway are now managed by Carrick Castle Estate Lodge and you use it at your own risk. If your mooring should lose its Crown Estate Scotland mooring tag, the club charges £5.00 to obtain a replacement. The Vessel Owners Agreement is an ongoing one for the life of one’s membership unless Crown Estate Scotland request amendments to the document. If you decide at any time in the future that you wish to give up your mooring, either by selling it or removing it you will need to complete the Crown Estate Termination/Nomination Form and send it to the club with your Crown Estate Scotland tag (if appropriate). 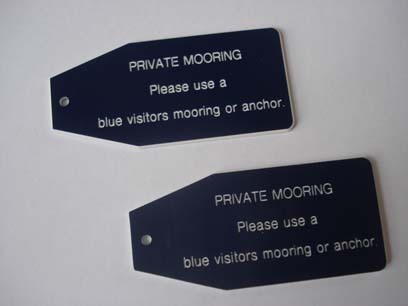 The Private Mooring tag has double-sided lettering. These have been very successful in keeping visiting boats off private moorings when a mooring is not in use by the owner’s boat. These are provided by the club to member’s moorings free of charge. If you require a quotation to have a new mooring laid, please contact the club’s mooring contractor, Cunningham Moorings (Neil Cunningham) on 01369 870334 or 07775 781890 for a quotation. Last year, 2017, the group mooring service charge to members was £120.00 per mooring plus the cost of any replacement tackle required – this may increase for 2018. When we have the latest figure, it will be updated here. It is worth noting that most insurance companies are prepared to cover vessels on their swinging moorings in Carrick Castle over the winter months as well as the main summer season. Insurance companies are listed on the Helpful Links page. If you take your vessel out of the water over the winter months, the following local places accommodate vessels – Holy Loch Marina, Sandbank; Kip Marina, Inverkip; Greenock Marina; Rhu Marina; McGruers Yard, Silvers Marine & DRB Marine in Rosneath; Sandpoint Marina, Dumbarton and Rothesay Dock East, Clydebank. The above service is free of charge. Crown Estate Scotland Mooring Licence No: XX34/343 – five year review date 1/1/2020. Original Licence granted on 10th February 1989. This Licence was updated on 1st January 2007. Since then Crown Estate Scotland have granted the club fifty (50) mooring positions on Loch Goil at Carrick Castle.